According to the 2013 – 2014 Global Competitiveness Index by the World Economic Forum, Singapore is the second best destination in the world (and indeed the best in Asia) for doing business. Two of the factors that have contributed to its standing are its labor market efficiency as well as higher education and training. On one hand, Singapore’s high standard of education has helped create a workforce that is ready to perform well in any industrial sector. On another, Singapore is still keen to attract niche-skilled professionals and innovators to work in Singapore, under work pass schemes such as the Employment Pass (EP) and Personalised Employment Pass (PEP). 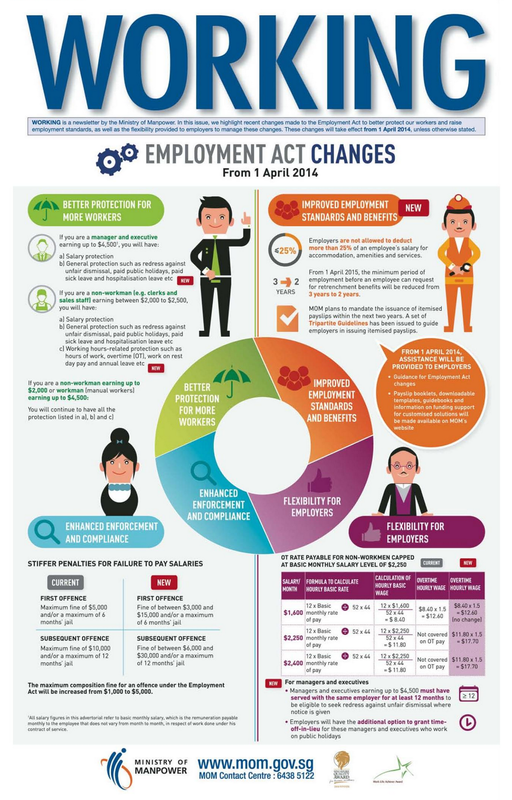 In a couple of weeks, starting 1 April 2014, amendments to the Singapore Employment Act (EA) will take effect to allow some flexibility to companies, raise employment standards and extend better protection to more workers. The Act was initially enacted in 1968 to protect the rights of workers as well as guide companies on basic employment practices. If you’re working in Singapore or are thinking of expanding your business in Singapore (and along with it, your headcount), apply these basic employment rules stipulated in the EA. You could very well save yourself some hefty fines and avoid time behind bars. The EA outlines recommendations for employers and covers all workmen earning less than $4,500 per month and employees earning S$2,000 and under per month. All employees must be under a contract of service. However, with effect from 1 April 2014, general provisions of the EA, save for part IV of the EA, will be extended to PMEs (professionals, managers and executives) earning up to S$4,500 as well. According to the Employment Act, all employees must be paid at least once a month and receive their salaries within 7 days of the end of the salary period. In case of overtime, all dues generated must be paid to the employee within 14 days after the end of the salary period. In cases of dismissals or termination by the employee, the salary must be paid on the last day of employment. If the employee leaves the employment without serving the required notice period, then the payment must be made within 7 days of the last day of employment. In addition, starting next month, employers cannot deduct more than 25% of the employee’s salary for accommodation, amenities and services expenditure. The amended EA also states that the failure to pay salary as recommended will cost employers a fine of S$3,000 – S$15,000 and/or 6 months’ jail for a first-time offence. A subsequent offence will be liable to a fine of S$6,000 – S$30,000 and/or 12 months’ prison time. So don’t do it. In terms of leaves and holidays, Part IV of the EA, which covers rest days, hours of work and holidays, does not apply to PMEs. For all others, part IV outlines the minimum number of days for annual leaves and rest days employees are entitled to per year, so long as they’ve worked for their current employer for at least three months. Employees are entitled to a minimum of 7 days of annual leave in their first year, with an additional day for every subsequent year they are employed with the company. All regulations regarding overtime are not applicable to PMEs too. According to the Employment Act, no employee can be made to work over 8 hours a day, or 44 hours a week, under regular pay. Once this limit is exceeded, the employer must provide the employee with overtime pay. With overtime, employees are not allowed to work for more than 12 hours a day. Employees are also entitled to a minimum of 1 rest day per week, which does not count as a paid leave. After an employee has been with a company for 6 months, they are entitled to 14 days of paid sick leave and 60 days of paid hospitalization leave in a year. Female employees who are on a fixed term contract, temporary or part-time employment are entitled to 16 weeks of paid maternity leave if she meets the conditions of the Child Development Co-Savings Act. If she meets the conditions under the Employment Act, she will be eligible for 12 weeks of maternity leave. Thanks to its multicultural population, Singapore has its fair share of public holidays. All employees are entitled to 11 paid public holidays per year. In case a public holiday falls on a Sunday, the Employment Act dictates that the following Monday be treated as a paid leave day for employees. If required to work on a public holiday, employees should be paid an extra day’s salary at the basic rate of pay or the gross rate of pay for that holiday. With effect from 1 April 2014, employers are allowed to grant time-off in-lieu for PMEs who are required to work on public holidays, subject to mutual agreement. In the absence of mutual agreement, at least half a day off in-lieu has to be granted. All employers in Singapore have to contribute to their employees’ Central Provident Fund (CPF). The CPF is mandatory for citizens and permanent residents of Singapore and acts as a retirement savings scheme. The employer is responsible for paying their portion of monthly contributions in a timely manner to the CPF. Employees holding either a work permit or an employment pass need not make CPF contributions. Neither is the employer to make contributions for them. To learn more, please click on the MOM infographic below which outlines the main changes to the EA.